Maps are a big part of the fourth grade social studies curriculum, but maps in a textbook can seem boring and hard to conceptualize for many students. Topographical maps are a great way to show kids how three-dimensional objects can be represented on a one-dimensional page. 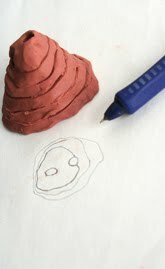 Ask your child to shape his own mountain out of the modeling clay. Encourage him to make the mountain an interesting shape, rather than perfectly symmetrical. Once finished, take the pencil and push two holes in the top of mountain all the way down to the bottom. Then, use the pencil to make horizontal markings on the clay from top to bottom about one inch apart. Assisting your child with the paring knife, cut the top most slice of the mountain. Go slowly and carefully so as not to smoosh your mountain! Put the first slice on your piece of paper, and have your child trace around it. Then color where the two holes in the clay appear on the paper. Place the first slice aside. Now cut your second slice and again trace on the paper. Be sure to line up the holes in the clay with the holes on the paper. Put the second slice aside. Repeat with the rest of your slices. Now have your child put his mountain back together again, and compare the model with his topographic representation. Does the map look like his mountain? Can he find the steepest side? The most gradual slope? The highest point? Discuss with your child why a topo map is a useful tool to have. What's going on: While modeling clay is usually endless fun all by itself, there's also important lifetime learning here. Maps provide abstract representation of all the earth's surfaces, and they'll show up in textbooks, classrooms, and all sorts of newspapers and magazines for years to come. With practice, your child will become fully comfortable with maps of all kinds--and may even ask to climb a mountain or two! Construct plaster models of areas on topographic maps. Flood one inch, draw a contour line in marker, flood one more inch, draw another line, etc. Remove water, look at lines from above, to illustrate the concept of contour lines. Alternatively, use clear salad trays from food stores. Trace one contour line on each tray. When completed, you will have a see-through 3D model of your landscape. For more information, see how to construct a Topo Salad Tray model. the contour interval – the contour interval for the Angel Island model is 100 feet.